The General Agreement on Trade in Services (GATS) is the first multilateral trade agreement to cover trade in services. The GATS mandates World Trade Organization member governments to progressively liberalize trade in services through successive rounds of negotiations. According to the principles of the WTO, the GATS sets a legal and regulatory framework for international trade, to which all WTO Members members are equally bound. The principle of non-discrimination is to ensure an equal treatment of all participants, whereas the promotion of trade and development is to be achieved through the progressive liberalization of trade in services. The WTO’s General Agreement on Trade in Services (GATS) was first established in 1994 as one of the “Uruguay Round” Agreements to be enforced by the WTO. Rules about actual trade in services across borders (via the phone or internet) is only a small element of GATS. The WTO called the GATS the world’s first multilateral investment agreement because its rules cover every conceivable way a service might be delivered, including granting foreign corporations the right to buy or establish new companies within the territory of another country. GATS is known as a “bottom-up” agreement because most of its requirements only cover service sectors countries agree to open up for competition by foreign corporations. 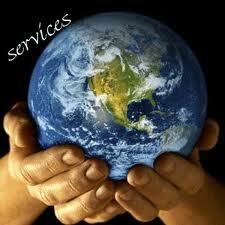 What is the Services Sector? Until recently, the service sector was viewed as the ‘soft’ part of the economy and did not produce the ‘real’ goods and services and therefore was not considered as important as the other sectors. In fact, the services sector was until recently defined as anything that was not a product of farming, mining and manufacturing. This view of the service sector changed, particularly in the 1980s, when it was realised that services lie at the hub of economic activity in any economy. These sectors are further subdivided into a total of some 160 sub‑sectors. Mode 4: Movement of natural persons – services provided by traveling to a foreign country to deliver the service. Who is a services exporter? You are a service exporter if a non resident customer pays you for your services regardless of where the service is provided. How will the SLCSI help the Services Sector? To represent the interests of the national services sector, including lobbying Government and promoting fair multilateral rules for trade in services.